RIVERSIDE: The Riverside motorcycle accident lawyers at Riderz Law have another unfortunate accident to report. Last Tuesday, a 51 year old Westminster man crashed his motorcycle while riding westbound on Borrego Salton Seaway, near Highway 86. The accident occurred when he lost control of his motorcycle and ran off the road, crashing into several boulders. The rider suffered major head injuries, and was flown to Desert Hospital. Sadly, the rider’s injuries were fatal. Our thoughts and prayers go out to this rider and his family. The California Highway Patrol did not report any other vehicles involved in the accident, and it is unclear at this point what caused the rider to lose control of his motorcycle. We will update this story if more details are discovered. Although a large percentage of motorcycle accidents are caused by careless drivers (who often fail to see motorcyclists when turning or changing lanes), a great number of motorcycle crashes are solo accidents–many of which are entirely preventable. Riders must know their surroundings, never drive too fast for conditions, and ensure that they are riding a motorcycle that is commensurate with their skill level. 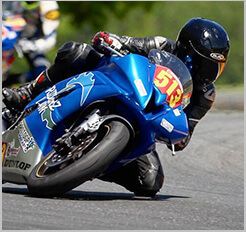 The motorcycle accident attorneys at Riderz Law encourage you to ride smart and ride safe.